You may have heard your dental hygienist calling out numbers during your last cleaning appointment.. “2-3-2” “4-3-3” “5-6-4”. If your dental hygienist didn’t explain the procedure to you, this is called Periodontal Probing and Charting or Periodontal Measurements. Periodontal Probing and Charting is one of the hygienist’s most important tools for determining the condition of your gums, what type of cleaning you need, and measuring the success of the treatment on subsequent appointments. In a healthy mouth, gums are tight and firm. When your hygienist is taking “periodontal measurements”, we are looking to see how far down it is until the gum tissue attaches to the tooth. As we get older, or when there is ether a gap in dental visits, and/or a lack in proper oral hygiene performance at home, the tissue often becomes saturated with bacteria. This results in inflammation of the gums and the tissue starts to pull away from the tooth. This creates a gap between the gums and the teeth, which we refer to as a periodontal pocket. These pockets easily trap food debris and allow bacteria to accumulate in the pocket eating away at your bone and gums. This leads to Periodontal Disease and the condition can no longer be treated without the help of a dental professional. Healthy gums generally have pockets that measure 1-3 millimeters (mm) in depth. Once the pocket depth reaches 4mm or more, the pocket needs to be professionally treated before the bacteria travels further down resulting in even deeper pockets, more inflammation, and eventual tooth loss. The standard treatment for Periodontal Disease is called Scaling and Root Planing (SRPs) also known as a “deep cleaning” and involves removing plaque, tartar, and bacteria that has . At Advanced Dental Care, we believe in providing you the most effective options for treatment in order to restore gum and bone health as quickly as possible. 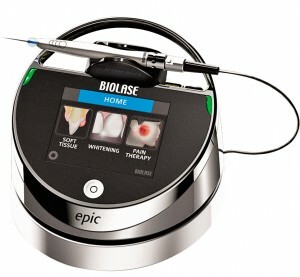 The gold standard of treatment includes Scaling and Root Planing, Laser Bacterial Reduction Therapy, and Irrigation. What do you use to measure these pockets? 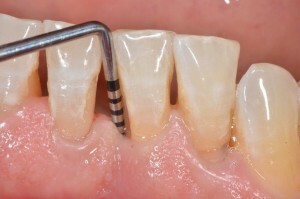 We use an instrument known as a periodontal probe to measure these pockets. Think of this instrument as a measuring stick for your gums. The probe has has black tick marks for each millimeter(mm) and allows us to measure the depth of your pockets. Healthy readings are anywhere from one to three millimeters (1-3mm). What happens if I have deep pockets? 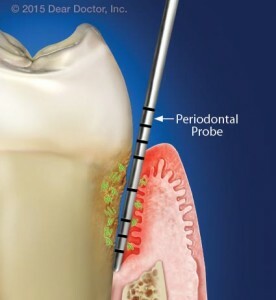 Periodontal probing lets us know how to best treat your gums and teeth. If you’ve reached 4mm pockets, we know we need to act fast to prevent the condition from progressing and the infection from spreading. The worst thing you could do is to let the infection persist and allow the bacteria to start eating away at the bone, which is what holds your teeth in place. Don’t worry! We can treat your periodontal pockets with same day treatment in our Costa Mesa dental office. The appropriate cleaning combined with Laser Bacterial Reduction (LBR) Therapy and Irrigation will help you get back on track! LBR and Irrigation application only takes a few minutes after your cleaning is done. Can deep pockets be reversed? Yes, if caught early! How and when periodontal pockets are treated in office, as well as your at home oral hygiene care, is crucial to the reversal and healing of the infection. Flossing is a MUST in order to keep periodontal pockets from worsening and the bacteria MUST be killed and treated to heal the tissues. Misty R. is a Registered Dental Hygienist at Advanced Dental Care in Costa Mesa, CA under Dr. Jeremy Jorgenson. 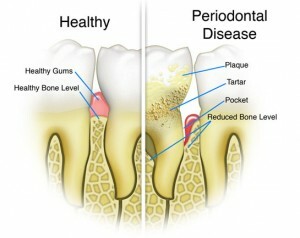 For more information about periodontal disease, laser bacterial reduction, irrigation or to book an appointment, please contact (714) 424-9099 or visit us online at www.mycostamesadentist.com!